Here at MillyanaTrees I make a number of seasonal decorations. They are made to order and you can choose your own colour combinations. I will be making a stock pile of Christmas decorations before next Christmas and will offer these at the various craft fairs I will be attending, so do keep an eye open for regular updates on these. The photo gallery below my made to order decorations includes photo's of different decorations I have made to date to give you an idea of what is possible and available. I can also make decorations for Easter and Halloween. Rodney is a very unique reindeer, he has beautifully decorated antlers and a shiny red nose, cousin of the infamous Rudolf, Rodney often gets asked to guide the sleigh when Rudolph's had a few too many mulled wines :). He would make a wonderful addition to any tree. If you would like a Rodney reindeer, please state what colour ribbon you would prefer. I also have Christmas ribbon available, so do enquire if you would like the choice of colours and patterns, this will be subject to what I have available. Frostbite is a pipe smoking carrot nosed snowman in a top hat. His little scarf is hand knitted on tiny needles. He has buttons up his front and sequin eyes. I can make either a top hat or a bowler hat or a bobble hat and the ribbon and scarf colour can be any of your choice. Of course you can order a Snowman minus a pipe as well if you prefer. I can also make one with a tangerine nose. State your preferences in your order form. My little christmas tree's are entirely random in their decoration and I use mainly sequins, however I can use charms and beads and watch parts too, so state in your order what you will prefer. These are all similar in size and are my basic Xmas decorations, all decorated at random with various sequins, beads and charms. The puddings have brandy sauce, berries and holly leaves. You can choose any colour ribbon you like, I also have a selection of Xmassy ribbons in stock, so do ask to see a sample of these when you order and I will send you the choice list. Baubles can be one or two sided with their decorations, as can the stars. Please state your preferences of colour, ribbon and one or two sided when ordering. You can also order baubles with letter beads decorating them to read Merry Christmas, or a message of your choice! Xmas Puds: (one sided only) £5 plus p&p. (two sided) £7.50 plus p&p. These baubles have a distinctive teardrop shape and are slightly larger than the round baubles. You can order them in any colour you like, they are one main colour and a different colour for the band around the middle, the ribbon with message is optional. Please ask for a list of ribbon choices when ordering. Teardrop Bauble: (one sided) £5 plus p&p. (double sided) £7.50 plus p&p. This lovely chap has tissue paper stuffed wings so that they can be crinkled and posed , he'd make a lovely window decoration on Hallows eve! 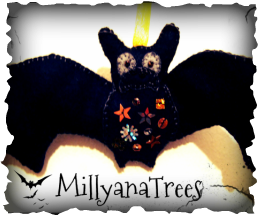 Halloween Bat: £15 plus p&p. Please click the Play button on the photograph below to begin the slideshow.